The hamstrings are a bugaboo for many yoga practitioners. Some of us may never have thought that the backs of our thighs were tight until we tried to touch our toes in our first yoga class and discovered we couldn’t…quite…get…there—or anywhere in the neighborhood. Even after diligently stretching our hamstrings for years, we might still feel as if we’ve made little progress, and discovered little ease, in forward folds. To unravel stubborn hamstring tightness, and potentially unravel the movement and postural patterns that may play a role in that tightness, we might need to try a different approach to stretching. Proprioceptive neuromuscular facilitation (PNF) is an approach that's often effective at increasing range of motion; it's a technique in which muscles are intentionally contracted, then intentionally relaxed. By offering the PNF cues below, yoga teachers can help students in their quest for greater hamstring flexibility. And yoga students can help themselves by adding some of these “invisible” actions to familiar poses while practicing at home or in class—regardless of whether or not their teachers cue them. But before we seek to release hamstring tightness using this method, let’s examine the origin of that tightness. 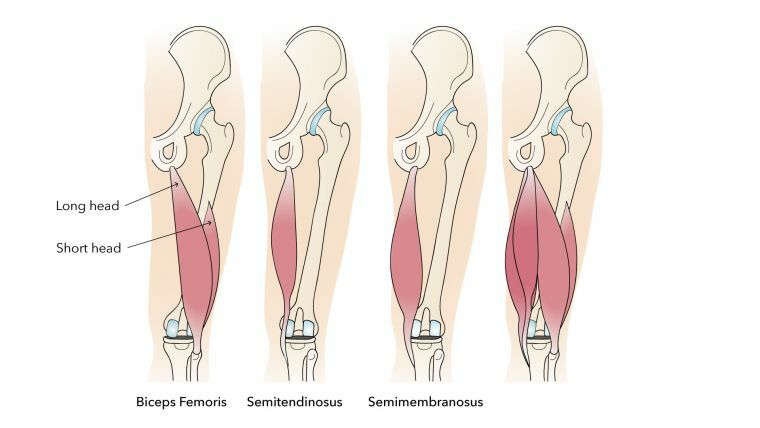 The hamstrings, a muscle group at the back of the thighs, consist of the semimembranosus, semitendinosus, and bicep femoris. They’re knee flexors (they bend your knee) and hip extensors (they move your leg behind you). The hamstrings contract in poses like bridge, locust, and dancer pose, and they lengthen in poses like forward folds. The hamstrings can become tight for a number of reasons, including athletic activity. Walking and running and sports that entail a lot of running—like tennis and soccer—require the repeated contraction of the hamstrings to decelerate the knee extension and bring the lower legs toward the buttocks. On the other end of the activity spectrum, sedentary behavior seems to play a role in hamstring tightness as well. Prolonged sitting, much maligned of late for its alleged role in everything from cardiovascular disease to cancer, may also be problematic for the hamstrings. One recent study, which found an “alarming” degree of hamstring tightness in healthy university students, concluded that sitting for extended periods (for example, in an educational setting) can be a significant factor in hamstring tightness. While sitting, the hamstring muscles are inactive and at their shortest; and they may become accustomed to this shortness. Furthermore, sitting can weaken the gluteals, leading to compensatory overwork by the hamstrings. Sitting can also negatively impact circulation to the lower extremities. Since circulation is important for muscle functioning and healing, it is possible that sitting for long periods after intense workouts may make it harder for muscles to repair themselves. As deep postural muscles, the hamstrings also affect, and are affected by, our habitual posture—in particular, by the position of the pelvis. Lower-crossed syndrome (LCS), in which the pelvis may be posteriorly tilted (tilted backward) or excessively anteriorly tilted (tilted forward), is characterized by a pattern of muscular imbalances that include the tightness of the hamstrings and the weakness of the gluteal and abdominal muscles. In some cases, in chicken-or-the-egg fashion, hamstring tightness may be caused in part by weak gluteals and abdominals; the overcompensation by the hamstrings for that weakness may then lead to further weakening of those underutilized muscles. 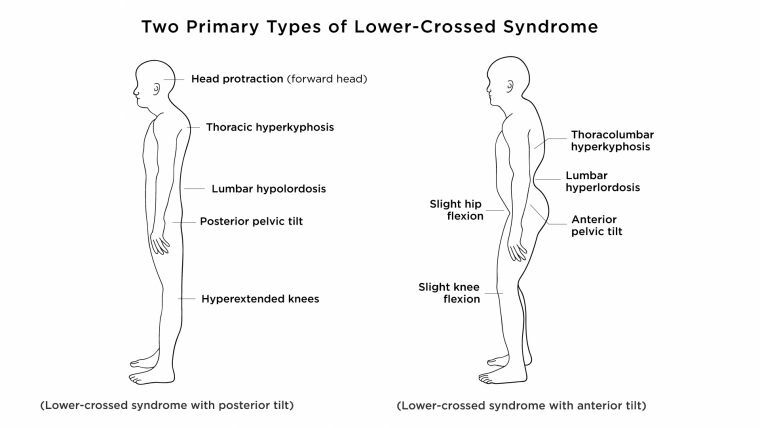 The two versions of lower-crossed syndrome are shown below. In the first, the pelvis is posteriorly tilted; the hamstrings, in a chronically shortened position, pull the back of the pelvis down, flattening the lower back. In the second, iliopsoas tightness raises the back of the pelvis to bring it into an anterior tilt—causing the lower back to overarch and leading to a feeling of “pull” on the hamstrings. Though the hamstrings are actually in a lengthened position when the pelvis is anteriorly tilted, they may feel tight when you’re standing, and their range of motion may be inhibited. Contracting the hamstrings—for instance, when you are moving into a squat or attempting to lift a leg when lying on your belly—may be difficult. The weakness of these “turned off” hamstrings (along with a tight iliopsoas, quadriceps, and erector spinae) may make it very hard to move from an anterior to a posterior pelvic tilt, as we must do to move deep into a forward fold. Those stuck in an anterior tilt may find it challenging to forward fold, not because their hamstrings are short, but because their pelvis can’t effectively switch its tilt. For those who run regularly, sit for long periods, and/or show either type of lower-crossed syndrome, PNF stretching may prove valuable for releasing the hamstrings. PNF is often used by physical therapists to increase range of motion and improve athletic performance. In a therapy session, a PT assists a client in this type of stretch, applying resistance selectively to create a muscular contraction before allowing a more passive stretch. The exact method by which PNF works is unclear. It may be due to an increase in tolerance, or because of an underlying neurological effect. (Interestingly, even the opposite limb to the one being stretched appears to benefit from PNF techniques, which suggests that there is a neurological component to the release.) Other research hints that PNF techniques may decrease the reflex that usually inhibits a deeper stretch. Although in a therapy setting PNF requires two people, you can adapt PNF principles to attain similar benefits on your own. (If you have an injury, however, it is safest to work with a PT.) 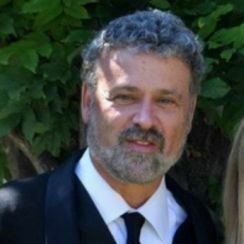 Two of the more common PNF techniques that you can modify are the contract-relax method (CR) and the contract-relax-antagonist-contract method (CRAC). The CR method seeks to lengthen the target muscles by first attempting to contract them against resistance, and then allowing them to stretch passively. If the hamstrings are your target muscles, you would lengthen them by moving your leg into a position in which you feel a slight stretch and hold that position while attempting to contract your hamstrings against the resistance of a wall, floor, or strap around your foot or thigh. Then you would follow with a passive stretch, in which you either relax as much as possible in your current position or go slightly deeper into the stretch. In the CRAC method, the goal is to contract the muscles that are the antagonists to the target muscles—the muscles that control the opposite action—before stretching the target muscles more passively. For example, the quadriceps, which extend the knee and flex the hip, are the antagonists to the hamstrings. So, to use this method, in a position where you feel a slight hamstring stretch, you would contract the quadriceps by straightening your leg and attempting to move your thigh toward your face against the push of your own hand. These two techniques can be practiced together, as in the poses described below. During the “active” portion of the following stretches, contract your muscles to 50 to 75 percent of your ability. During the passive portion, do not push too far. When our muscles are inactive, so too are our neurological defenses against overstretching. If a stretch is causing any pain or even tingling or numbness, back out of the stretch until that sensation subsides, or take a break. Note that those with osteoporosis or a history of lower back pain should play it safe by keeping a long, neutral spine rather than going into forward folds to an extent that rounds the back. You can embed the poses below in a traditional yoga sequence, or practice them on their own. 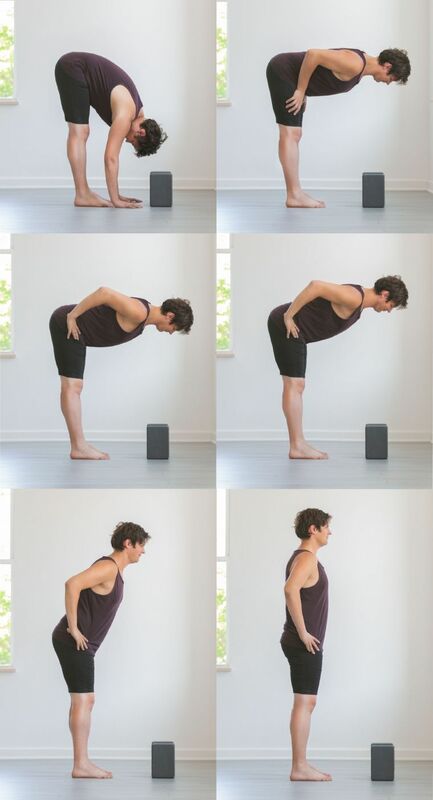 You can practice the poses below in the order described, or cherry-pick the one or two that feel most valuable to you. For the first pose, you will need a doorway (or pillar) and may want a block; for the second, you may want blankets or a bolster to sit on; for the third, you will need two blocks or a chair. 1. Lie down on your back near the left side of a doorway, placing your left leg against the wall and extending your right leg through the doorway. (It may be easier to get this close by rolling onto your right side, bringing the left leg up the wall, and then turning onto your back. If tightness in your hamstrings does not allow you to bring the entirety of your left leg against the wall, don’t worry: Come only as close as you can while feeling a tolerable degree of stretch. As you repeat this stretch, aim to gradually inch closer.) Flexing your left foot, press your left leg into the wall to activate your hamstrings for two or three breaths. 3. Relax your leg against the wall for two or three deep breaths. Repeat two more times on this side, then switch sides. 1. Sit upright, lengthening your legs out in front of you. Press your palms (or fists or fingertips) on the floor alongside your hips and reach up through the crown of your head. Gently curve your lower back in toward your spine. (If your lower back is rounding, or if the stretch you are feeling is too intense, sit on one or more folded blankets or a bolster and/or bend your knees until you are able to draw the lower back in slightly and the stretch becomes tolerable.) In the position where you feel the beginning of a stretch along the back of your legs, press your heels into the floor to activate your hamstrings for two breaths. 2. Keeping your spine as long as possible, bring your hands to the tops of your mid thighs (not on or near your knees). With your heels pressing down, press your thighs up against your hands (without actually moving your thighs or your hands) for two or three breaths. 3. Relax for two or three breaths. If you are feeling a considerable stretch with your hands on your thighs and your spine upright, stay there. If you want more sensation, fold forward, allowing a gentle, even rounding of your back as you bring your torso closer to your thighs. 1. 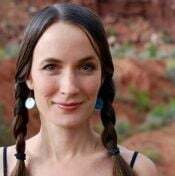 Standing up tall in tadasana (mountain pose), reach your arms overhead alongside your ears. Then lift your chest, arcing into a gentle backbend that is sustainable for you, drawing your belly lightly toward your spine with every exhale to support your lower back. 2. Contract your hamstrings by grounding your heels and attempting to move your heels down into the ground and backwards (without actually moving them). Maintain this action for two or three breaths. 3. Now attempt to contract your quadriceps by pressing down with the balls of your feet and toes, and aiming to move your feet forward (without actually moving them). Maintain this action for two or three breaths. 4. Return to a vertical spine, placing your hands on your hips, and hinge forward at your hips. Rather than bending your knees to make this fold more accessible, keep your legs straight and pause as soon as you feel a stretch—even if that means your spine is still parallel to the earth (or higher). In this “flat-back” position (ardha uttanasana), place your hands on blocks, or the seat of a chair, or on your thighs, or your shins. If you don’t feel a stretch in this position, drape further into standing forward fold (uttanasana). In standing forward fold, you can rest your hands on the floor or grab opposite elbows. In either fold, relax as much as possible for two or three deep breaths, making sure the back of your neck is long and comfortable and dropping your weight down evenly into your heels and the balls of your feet. Come up by first bringing your hands to your thighs and projecting the spine forward. Keeping your spine long, place your hands on your hips. Reach out through the crown of your head as you hinge up to standing with a long spine. • If you are on a quest to release your hamstrings, repeat the PNF sequence above two or three times a week. • Additionally, pay attention to your posture throughout the day. When you are standing and seated, do your best to keep a neutral pelvis, tilting your pelvis forward just enough so there is a gentle curve in your lower back, and drawing your belly in and up on your exhales. • Using lumbar support while sitting will help those with a posterior pelvic tilt and a flattened lower back find a gentle inward curve of their lumbar spine and bring their pelvis to a more neutral position. For those with anteriorly tilted pelvises, lumbar support will minimize fatigue of the lower back muscles. • As you sit, you can also massage your hamstrings with a tennis ball or a massage ball: Place a ball under one thigh and move your leg from side to side several times. Be sure to try this with the ball in various places: closer to the knee, mid-thigh, and closer to the pelvis. Massage the hamstrings several times each day. • Take breaks from sitting to stand, stretch, and walk. You might even consider walking backward. A preliminary study strongly suggests that backward walking can help to release the hamstrings and even reduce lower back pain—perhaps because of how the muscles are used in this movement, or because of a neurological change induced as the body gets used to a new pattern of movement. Through such persistent efforts, you may well discover that the tightness in your hamstrings decreases—and your ease in forward folds increases.